Have you ever had one of those moments where you didn’t know that you needed something so badly until someone told you about it? And as soon as you found out, you knew it was everything you’ve ever needed (this isn’t just a want, this is a NEED – like basic essential human needs). Well I recently had one of those moments. I was at Trader Joe’s during my monthly quick shopping trip to get some almond butter and coconut cream (and a few other essentials) when I stopped in my tracks and saw it. Cashew butter. I’ve always heard of cashew butter but almost sort of thought it was a myth. Similar to Big Foot or the Lock Ness (who is supposedly just a giant catfish – what!?!). Cashew butter obviously ranks right up in there with those two. So instead of grabbing my typical almond butter, I lunged for the cashew butter and didn’t look back. Actually I did look back a few times to see if anyone saw me because I was unnecessarily excited. As soon as I got home I slathered that cashew butter all over a brown rice cake and topped with a few fresh blueberries. I closed my eyes and experienced pure bliss. Ohhh yeah this is the stuff dreams are made of. I then did what any good foodie would do and posted it on Instagram. Now THIS. This is the moment where I found out what I had been missing my entire life and now needed stat. One of my lovely friends from the Instagram universe replied to my photo “Have you ever tried cashew macademia nut butter? WHAT! This is a thing? It exists? This must much on a whole level from Big Foot and the Lock Ness monster. This is like Taylor Swift is my best friend kind of mythology. Right? Wrong! It’s real and it exists and I made it and it’s awesome. And you should too! 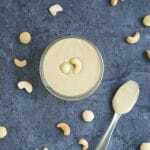 This cashew macadamia nut butter is a fun change up from the typical peanut butter and is super creamy. Add it to your smoothies, smear it on your sandwiches, or serve with fresh fruit! Gluten-free, dairy-free and vegan. In a high powdered food processor (or Vitamix), combine cashews and macadamia nuts. Blend until you get a fairly thin liquid. You may need to scrape down the sides of the food processor occasionally. Mix in salt and sweetener, if using. Store in a mason jar or other air tight container in the refrigerator. *I used my Vitamix for this recipe and it easily took under 3 minutes to blend until I achieved a nice, thin consistency. If using a high powered food processor, it may take upwards of 25 minutes. Make sure to give your food processor a break every once in awhile so you don't burn it out. It will come together eventually, I promise! **I don't like overly sweet things, so I do not sweeten my nut butter. You may sweeten yours depending on your tastes. I think about one tablespoon should do the trick! Haha! Love your enthusiasm in this post. It makes me want to make this RIGHT NOW! !